Blog Which stroke order is correct? Does it matter? In my previous article about stroke order, we looked at why learning correct stroke order is a good idea. In this follow-up article, we’re going to discuss what “correct” stroke order means anyway. Remember that the reasons for learning correct stroke order are related to practical things. This means that you shouldn’t learn it because I or someone else tells you to, you should do it because it will genuinely help you write better characters. That being said, in some cases, it’s not obvious what correct stroke order means. The variations are usually small, only differing in the order of a few strokes, often when two stroke-order rules are in conflict with each other. 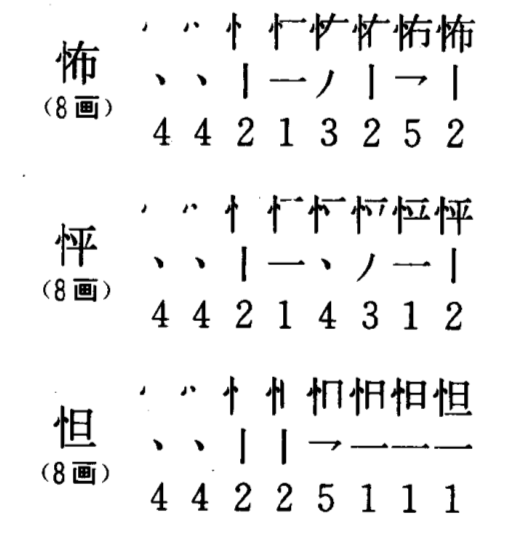 Some of these differences are because of regional differences; one version is standard in Mainland China, one in Taiwan; the Japanese character uses a third version. In other cases, there’s no regional preference, it’s just that it makes sense to write the character both ways, so both orders are common. Note that “makes sense” here doesn’t mean from the perspective of a foreigner who has studied Chinese or Japanese for a few months, it means from the perspective of a literate native speaker. In other words, it doesn’t mean that anything goes. Don’t invent your own stroke order! If you learn to write in a certain way from a reliable source such as a dictionary or a competent teacher,you can safely ignore other variants if you want. As long as you follow a standard, you should be okay.It doesn’t matter that much which standard you follow. For example, when you write the strokes in 忄 (the vertical radical version of 心, “heart”), you can write it in any of the various available ways. You have better things to remember than such subtle differences. If you really want to know, the Mainland standard is dots first, then vertical stroke; Taiwan standard is left to right. In Skritter, we use Mainland standard as described in 现代汉语通用字笔顺规范. This means that when Skritter shows you the stroke order for characters, this is what you will see. For characters that only appear in the traditional set, we use Taiwan’s Ministry of Education dictionary. However, for the reasons discussed in the previous article, there’s no reason to exclude other standards, so even if we write 忄 with the dots first, then the vertical stroke, you can write this character component from left to right and still get it right. Skritter won’t complain. This is true for a large number of other character component too. Still, if you do something strange like writing the character backwards or trying to write the vertical stroke from the bottom up, Skritter won’t accept that. Please also note that we update our character database continuously, so if you find a stroke order error or think we ought to accept something we currently don’t, just contact us and we’ll fix it! Follow a standard, which one doesn’t matter as long as it’s being used by native speakers. Don’t invent your own stroke order even if you think it feels better, at least not until you know how to write relatively well. Skritter will help you and show you the Mainland standard, but will also accept other variants. This article is based on my experience of learning and teaching how to write Chinese characters. What’s your experience? Did or do you find stroke order to be a big problem? If not, what strategies did you use to make it easier?